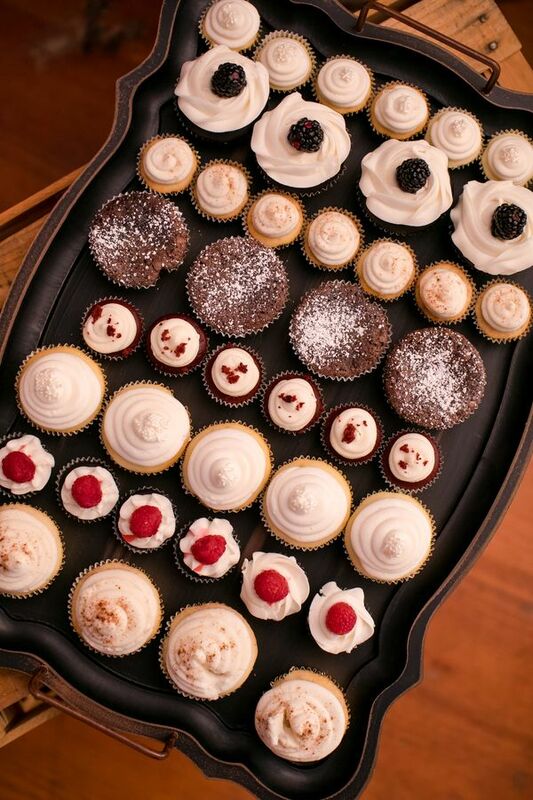 We sure do hope y'all have been enjoying the holidays! 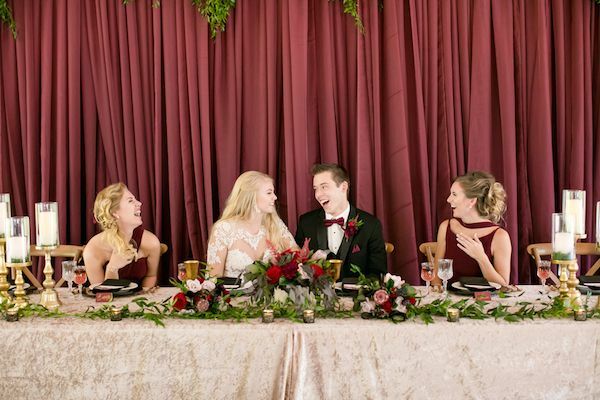 It's such a special time of year and so we couldn't resist sharing this fun and festive styled shoot captured by Jeannine Marie Photography with event planning by Rustic Elegance. 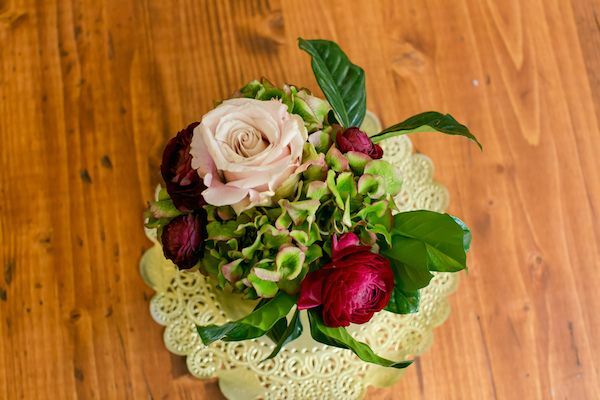 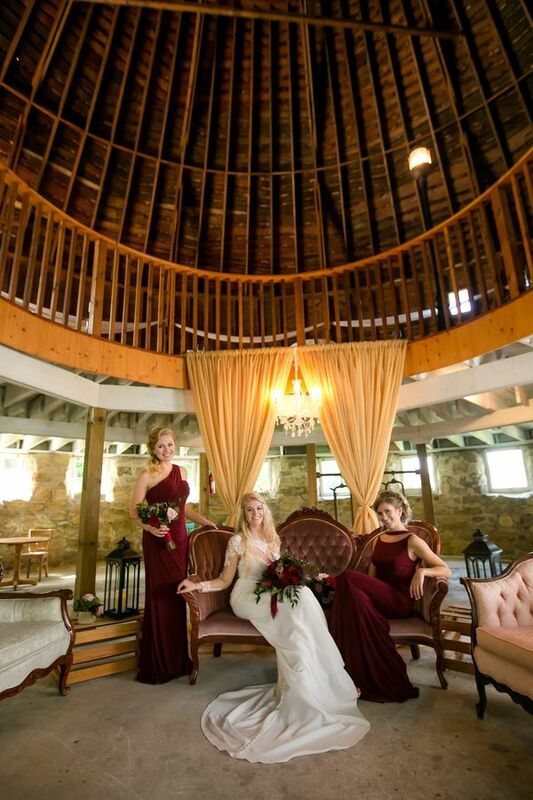 Get ready for gorgeous with florals by Studio B Floral Designs at the always charming, Round Barn Farm in Red Wing, Minnesota. 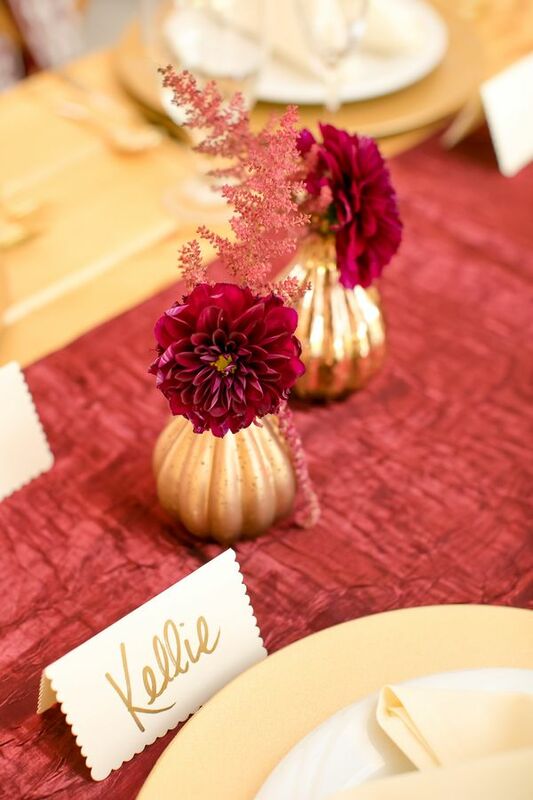 From the team, "Our fall wedding offers a unique alternative to the traditional red, orange, and yellow fall color schemes. 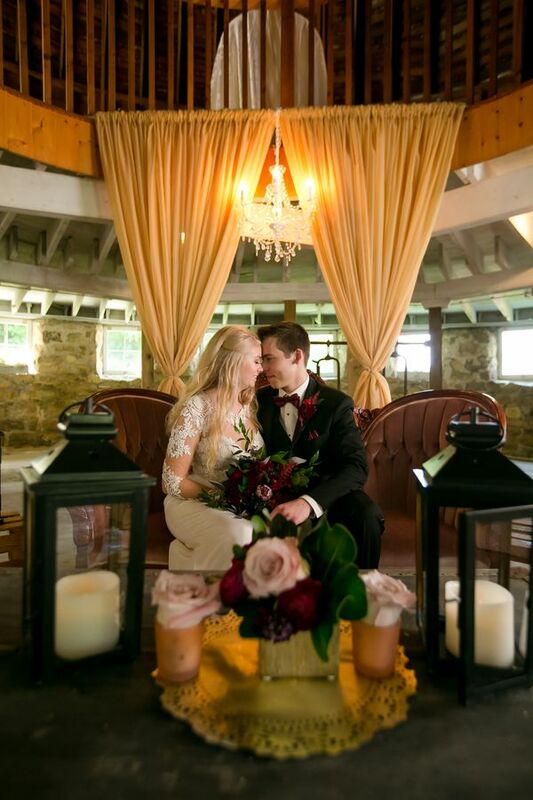 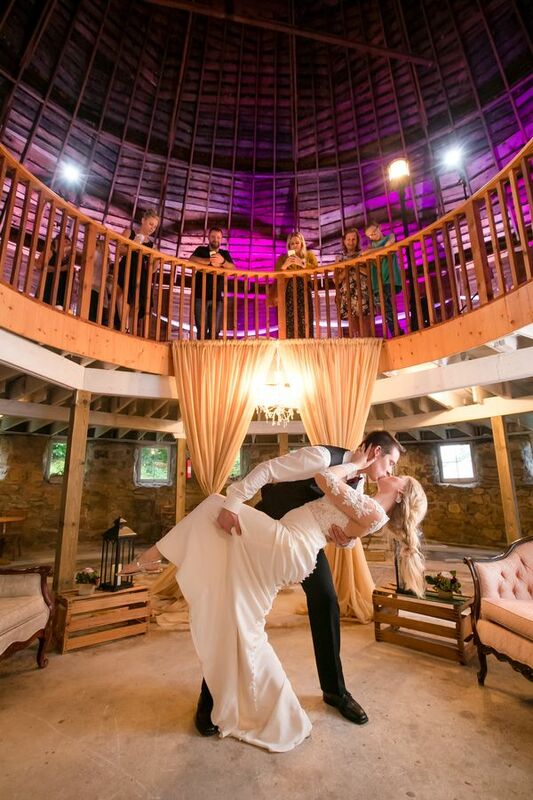 With burgundy, gold, and black details, barn wedding experts with Rustic Elegance planned a romantic styled shoot at this sixty foot high round barn that was built in 1914." 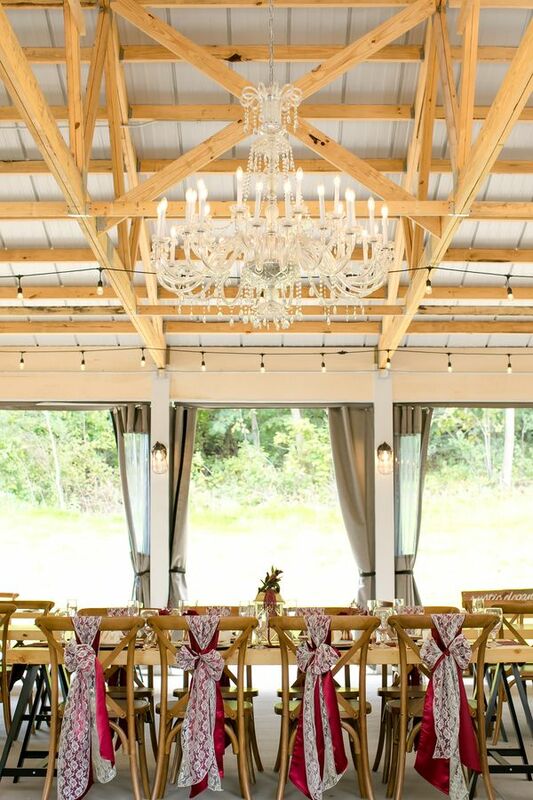 "Offering stunning views of the Mississippi River Valley, this venue is surrounded by thirty-five acres of meadows, woodlands, and bluffs." 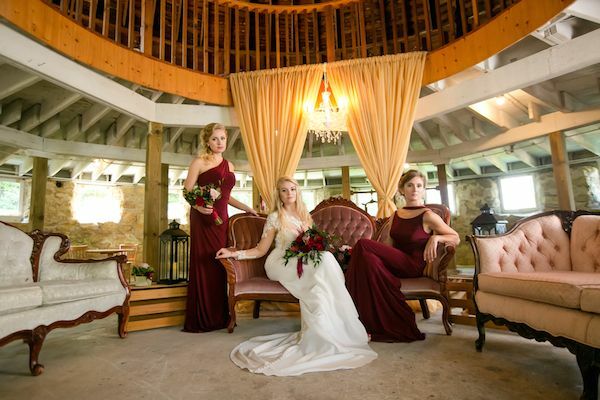 "Fringe Boutique provided gold jewelry for our ladies. 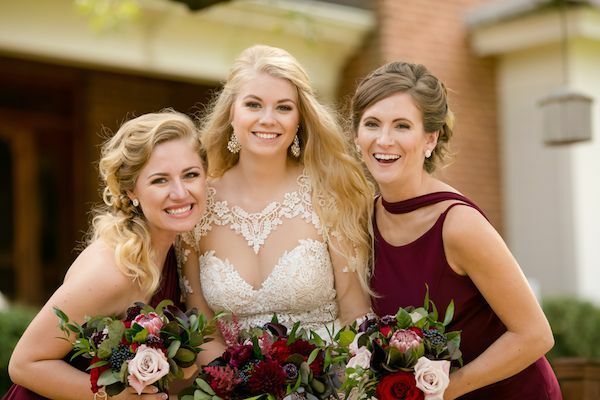 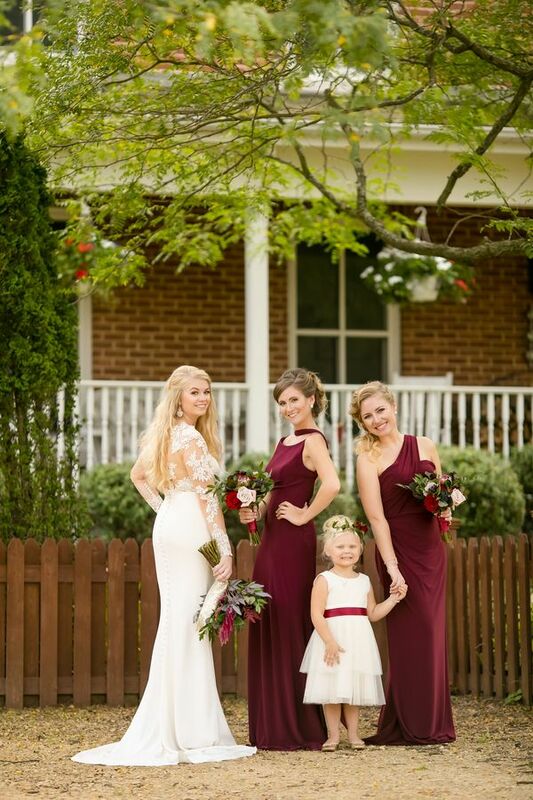 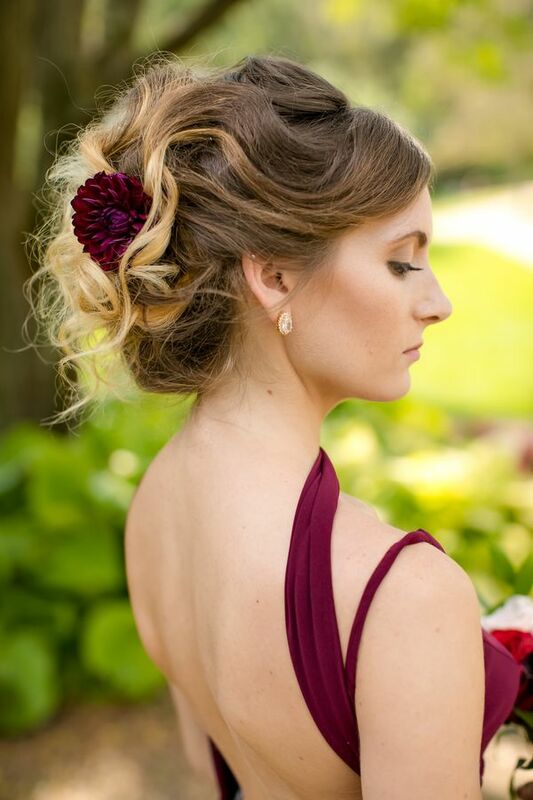 The bridesmaids are both wearing long, elegant burgundy dresses in two different styles." 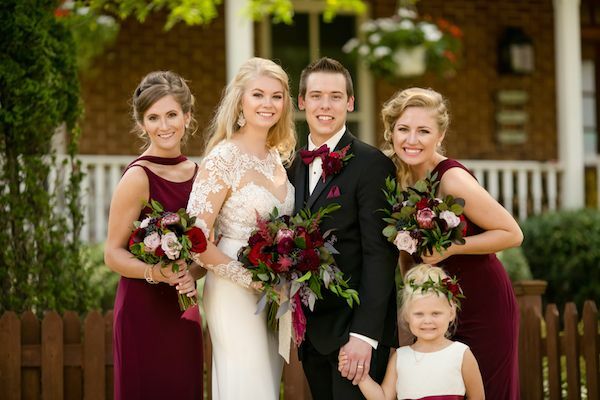 "Our flower girl is wearing a white dress with a burgundy sash and floral crown to compliment the bride and her bridesmaids." 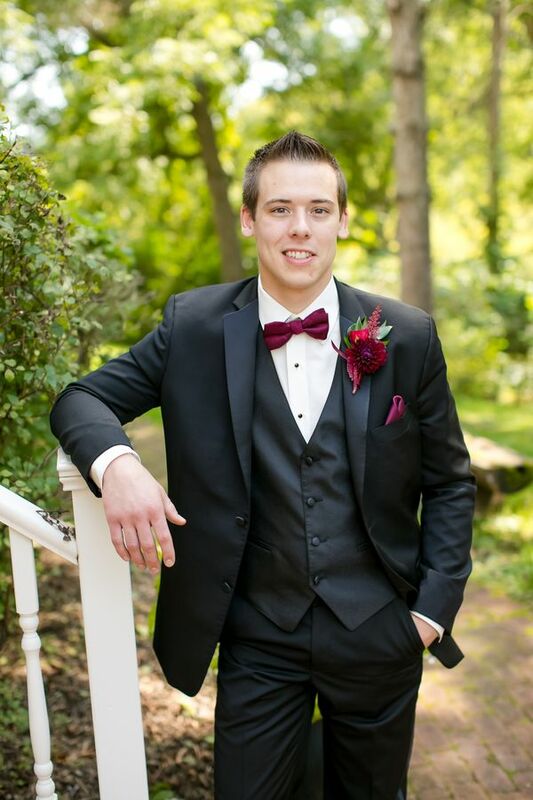 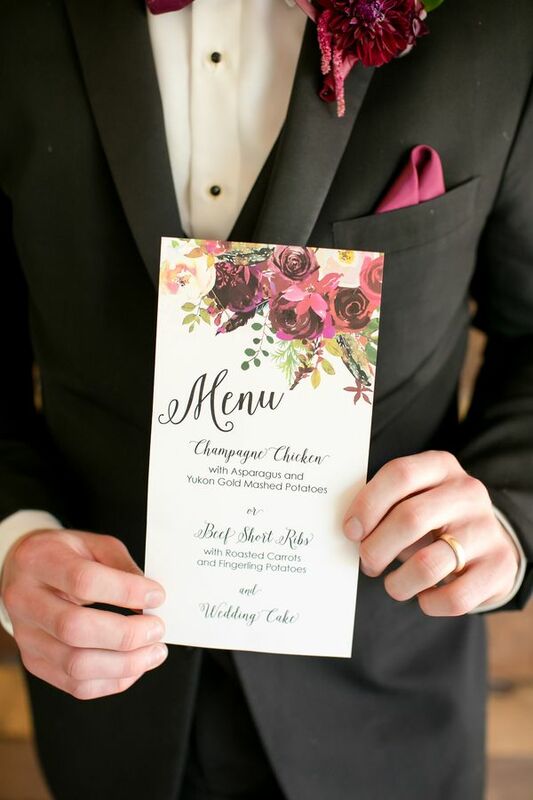 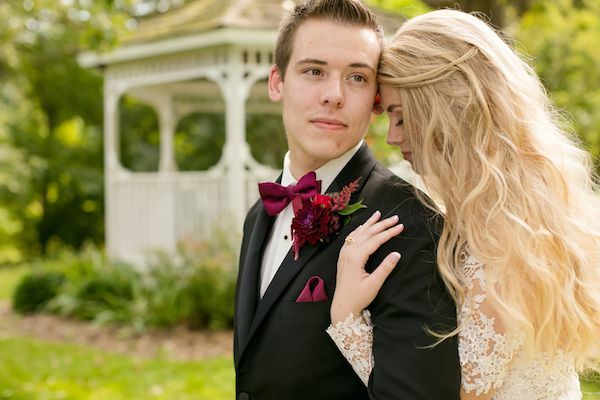 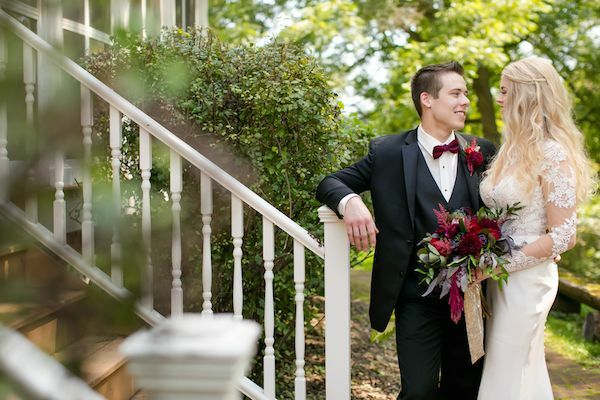 "Our groom is wearing a traditional black suit with a burgundy bow tie and pocket square. 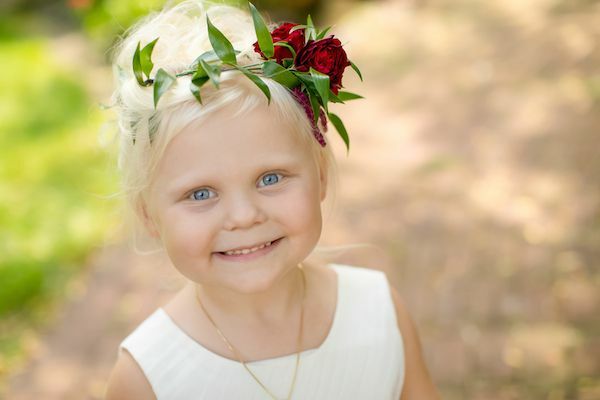 Our little ring bearer is twinning with the groom for a beyond adorable look!" 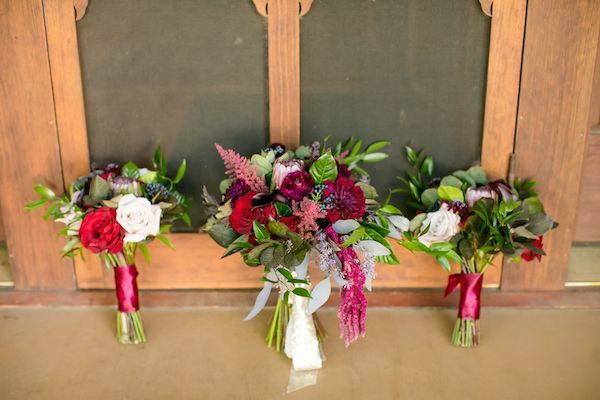 "For our floral design throughout the day, Studio B Floral created burgundy, red, and purple arrangements." 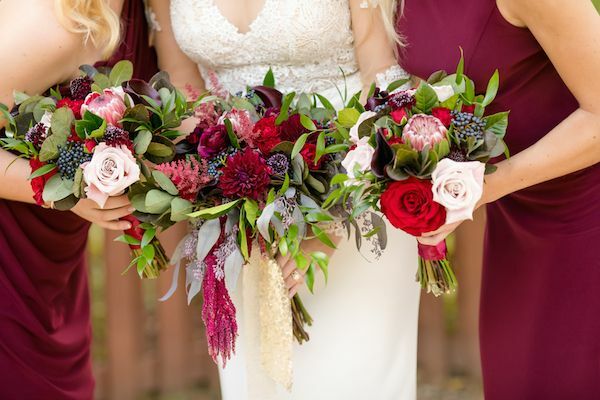 "Our bouquets even have pops of blueberries! 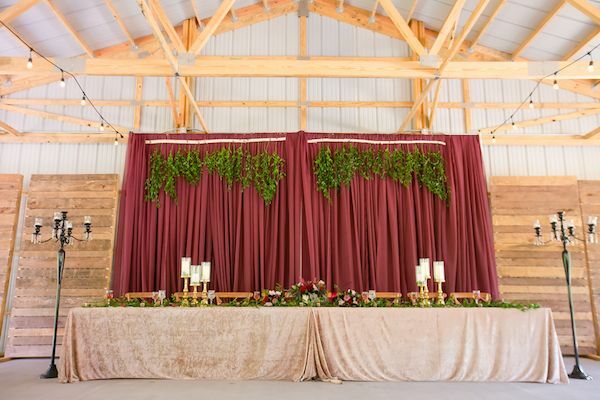 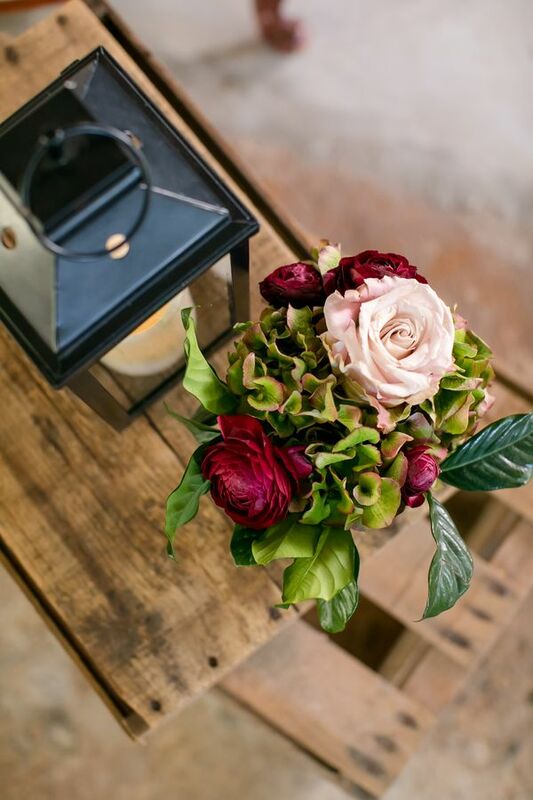 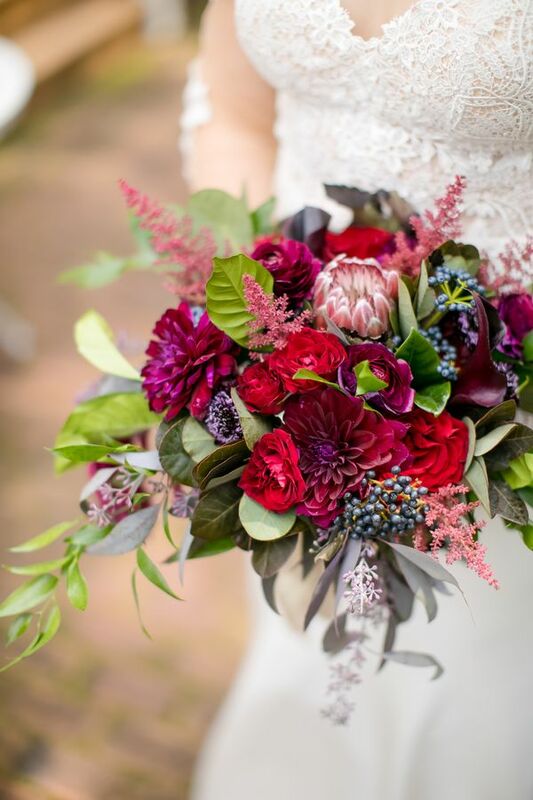 Hanging amaranthus were also used throughout the day to add more burgundy to our details." 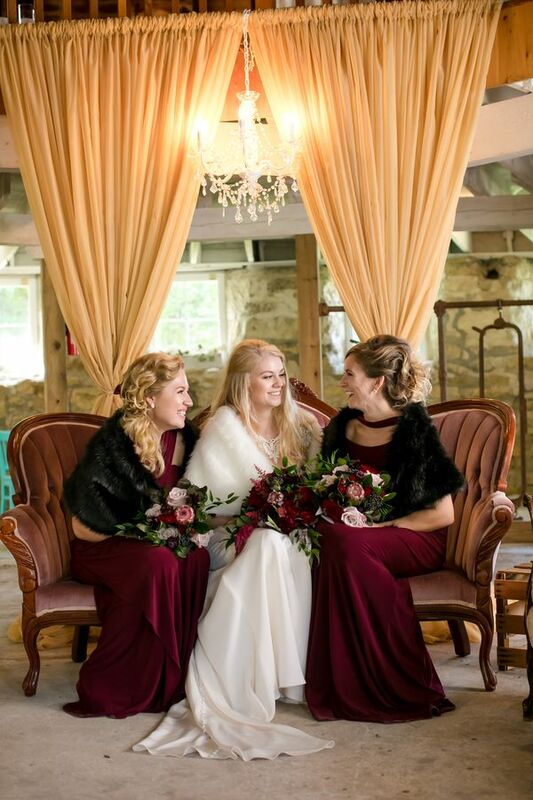 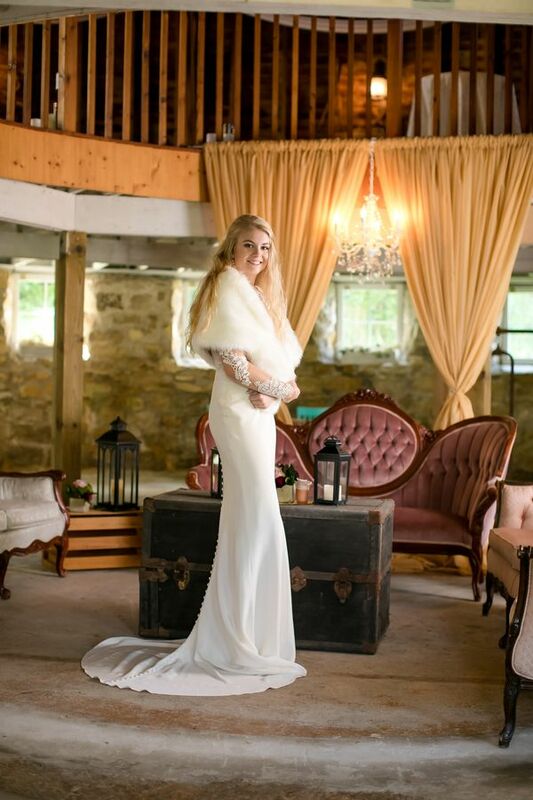 "For fall weddings with cooler weather, fur wraps were used to showcase a stylish look that also allows warmth!" 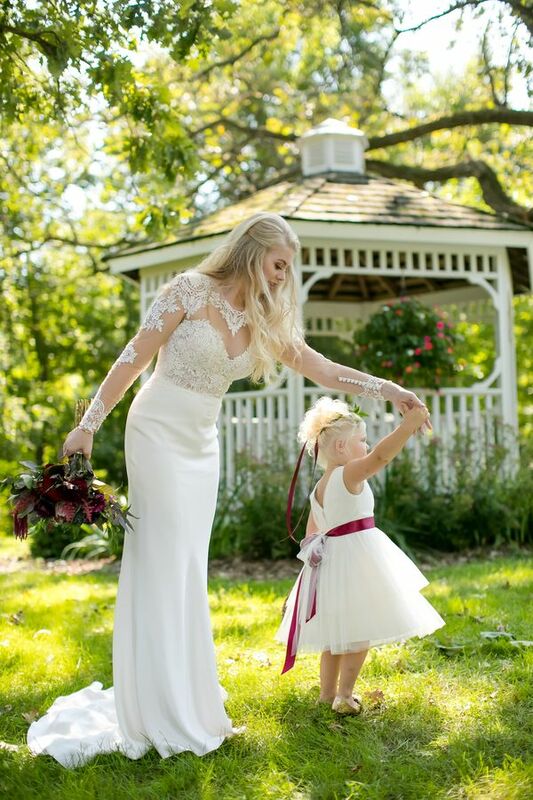 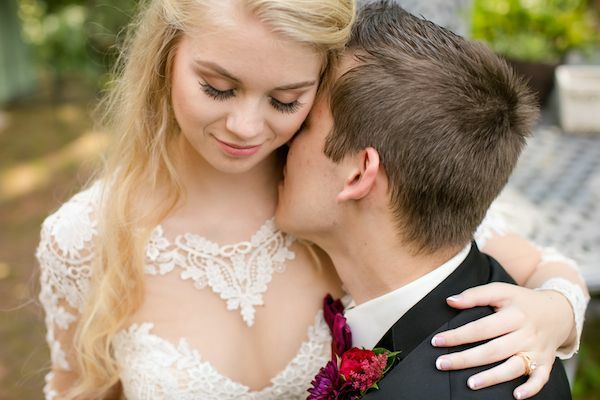 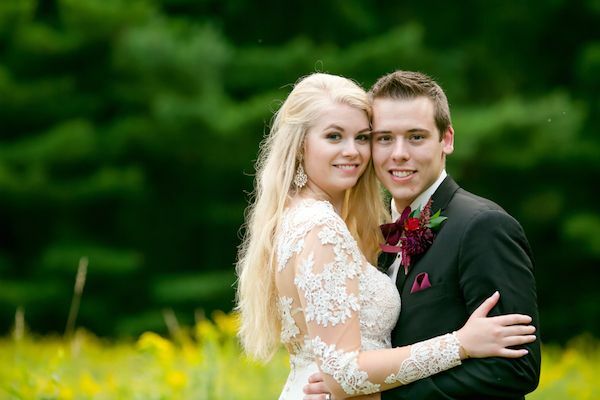 "For a romantic bridal style, our bride's wedding gown from Bridal Accents Couture has sheer long-sleeves and neckline with lace embellishments." 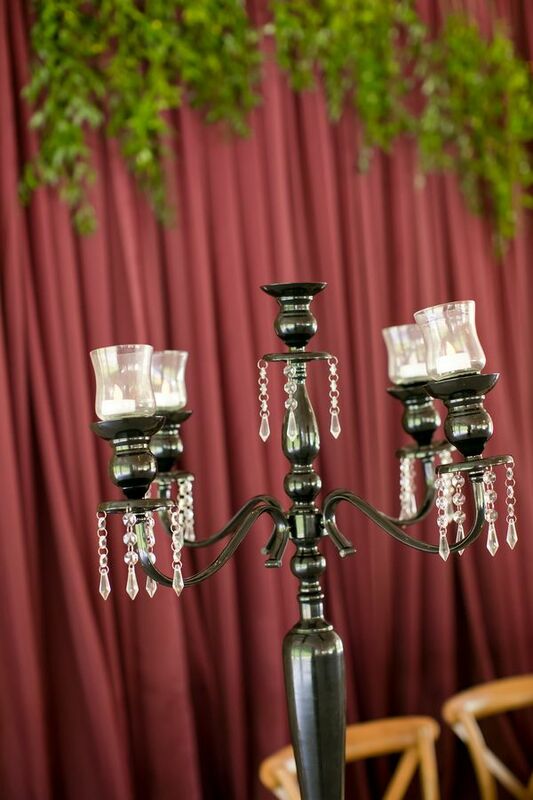 "Hanging amaranthus is used to tie the side draping while black sashes are used for the ceremony backdrop and chairs." 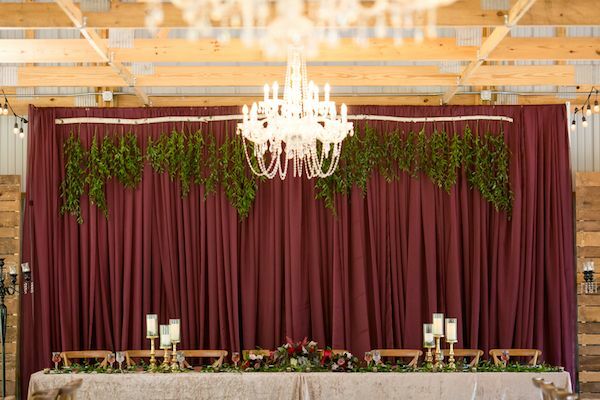 "Studio B Floral created a hanging floral ball with burgundy blooms and greenery for the couple to stand underneath as they say “I do.” "Since the venue is full of natural beauty, we kept the outdoor ceremony site decor simple. 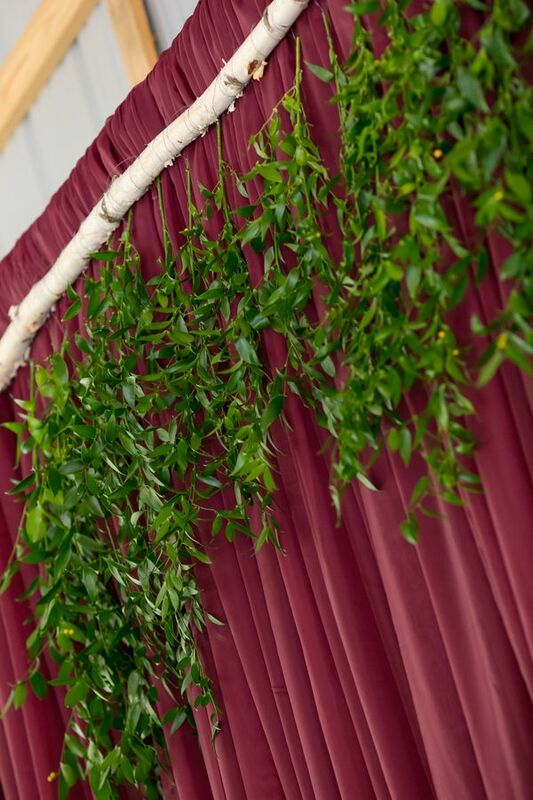 We've Got It Covered used white draping to frame the site and for the ceremony backdrop." 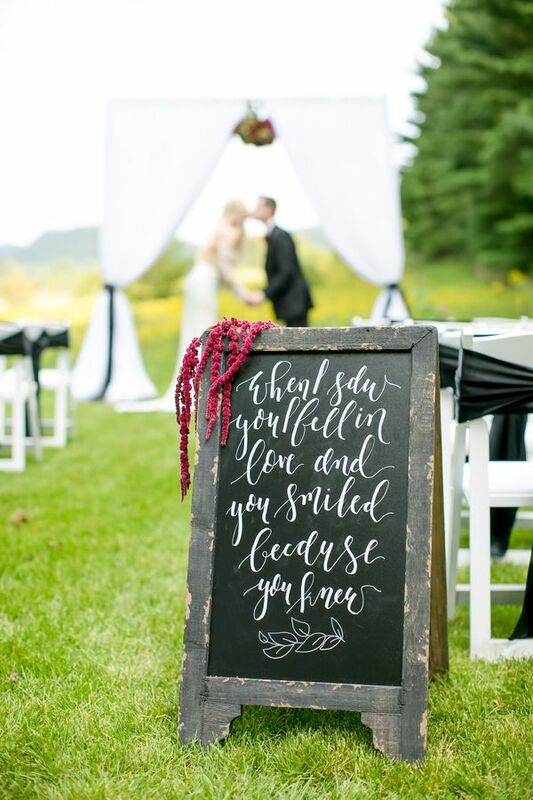 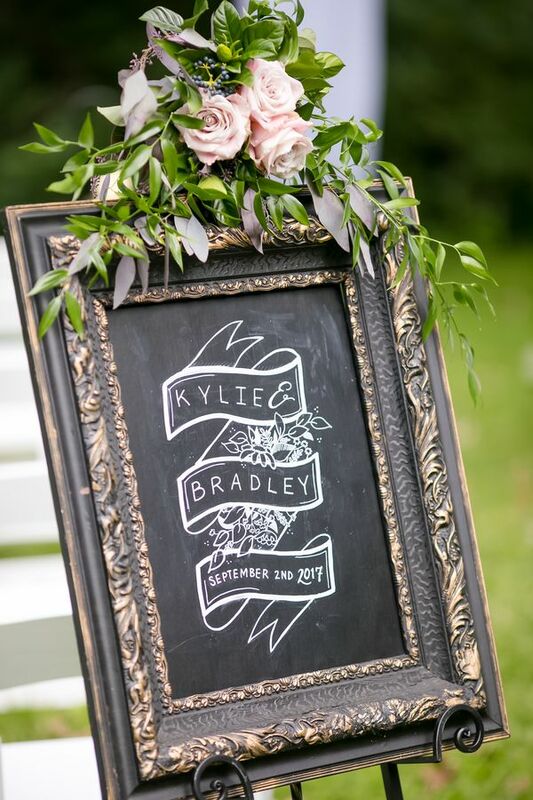 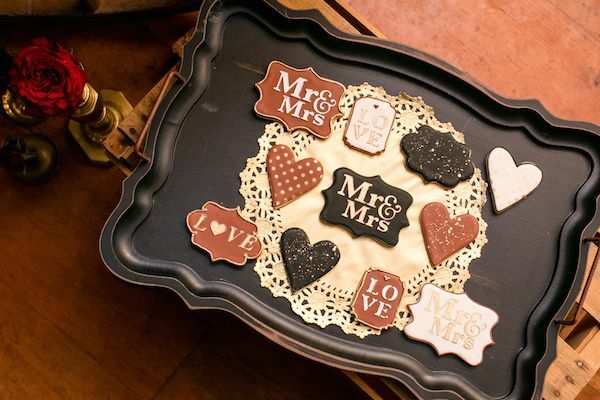 "...while Love Letters designed a beautiful chalkboard sign for the end of the aisle decor." 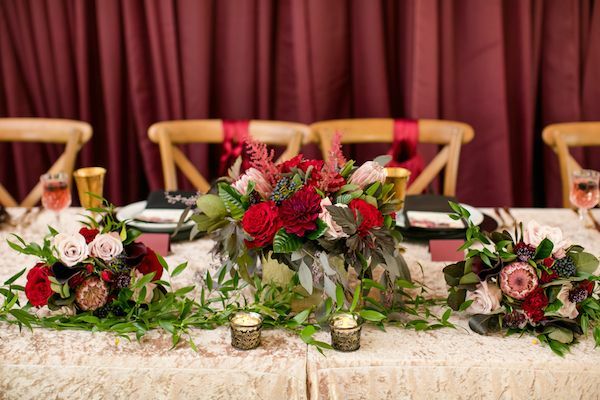 "Our reception decor consisted of two tablescapes: one for a guest table and another for the head table." 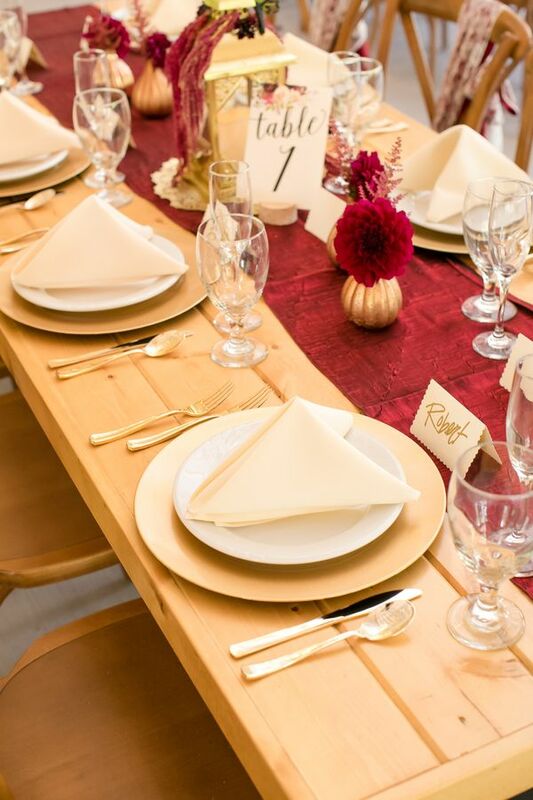 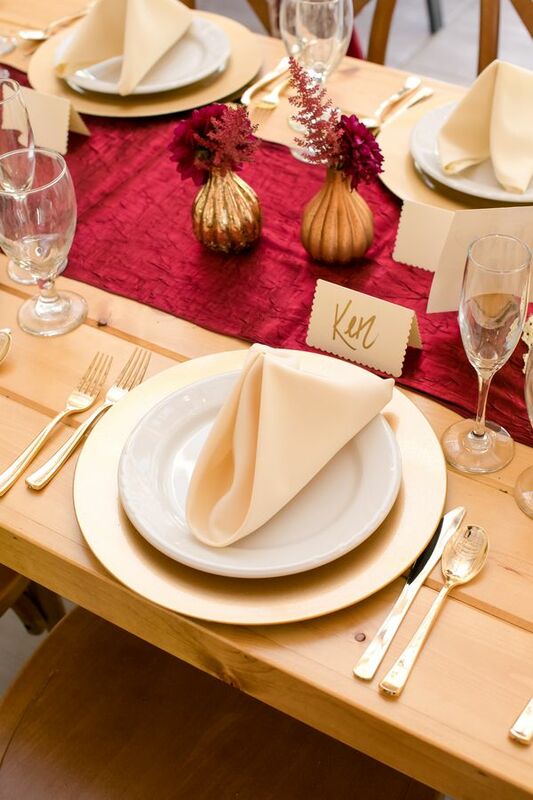 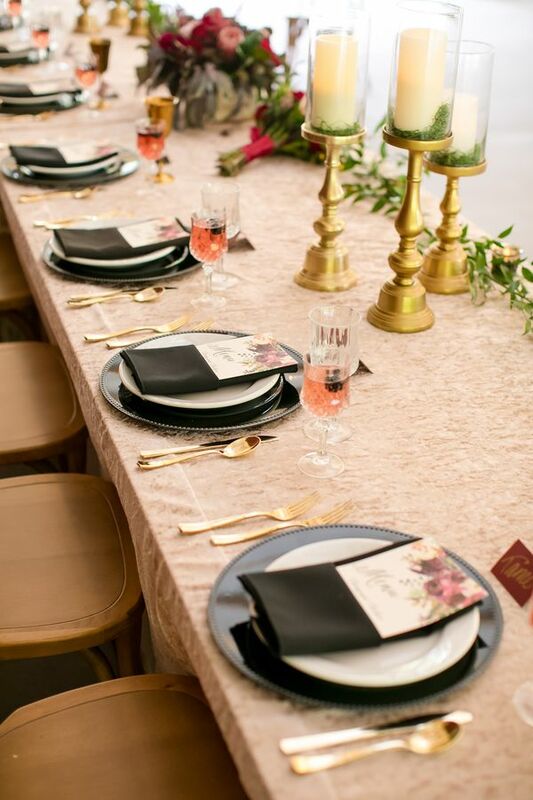 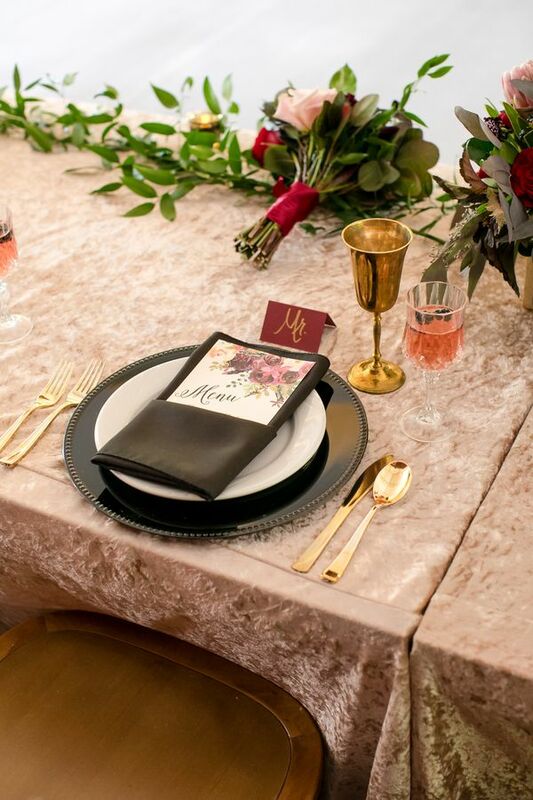 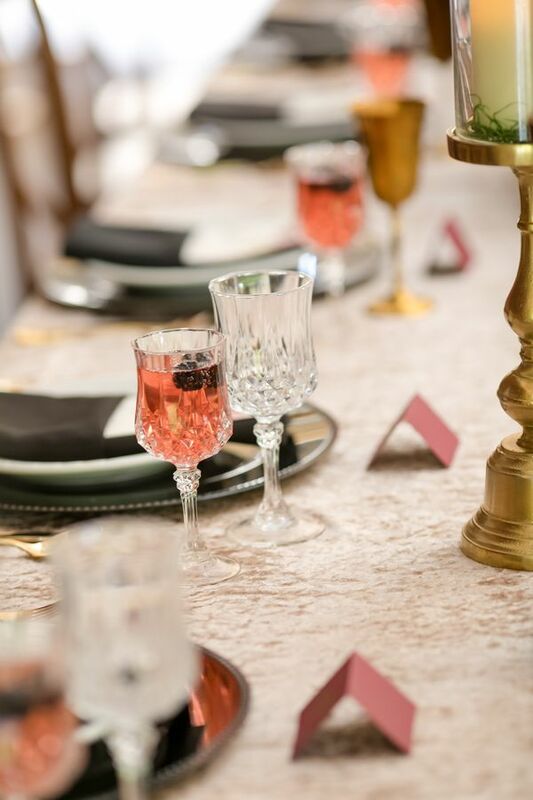 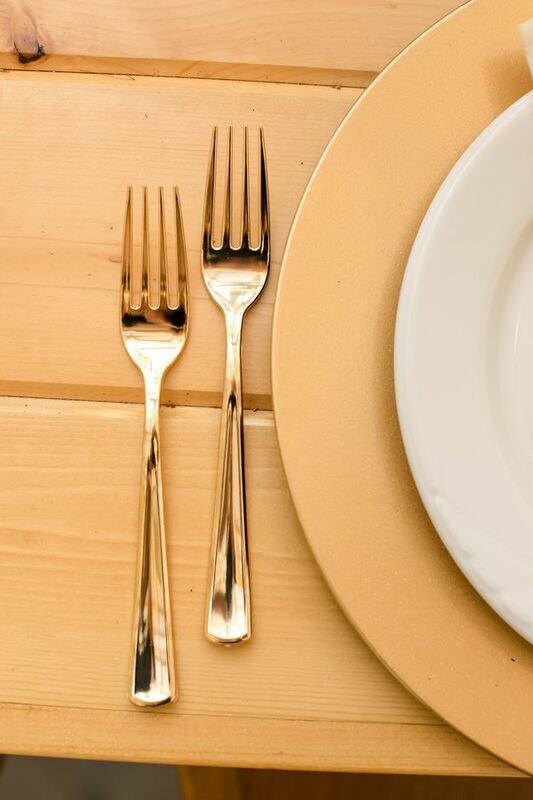 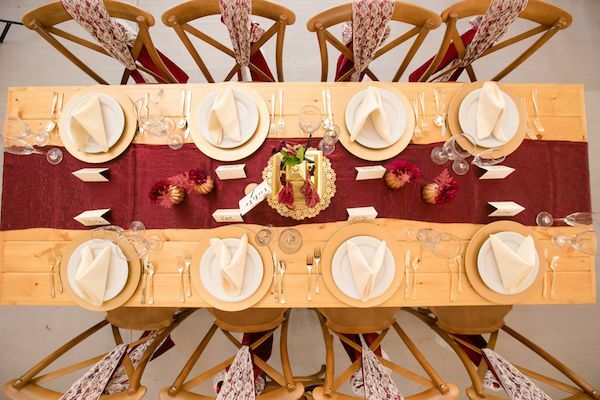 "Our guest tables have a burgundy, cream, and gold color scheme. 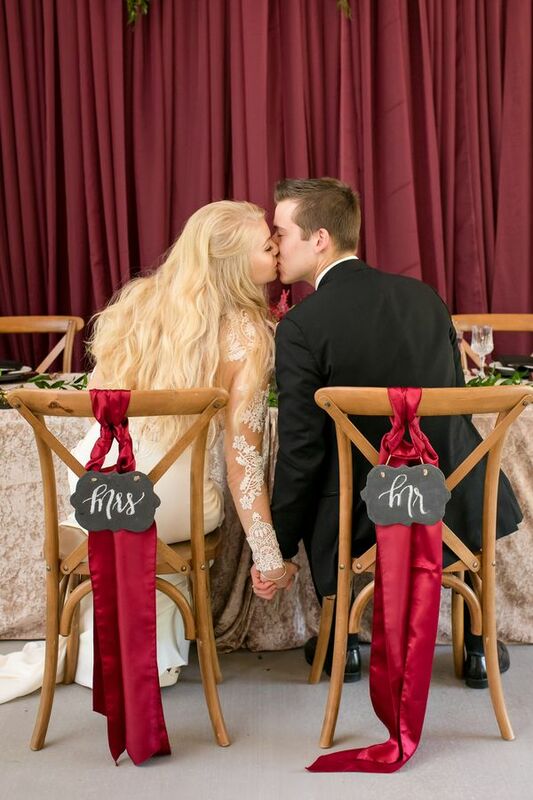 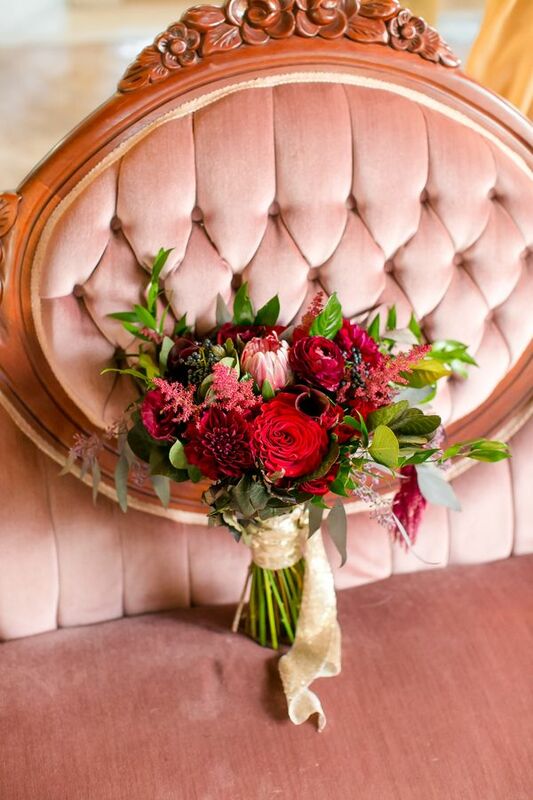 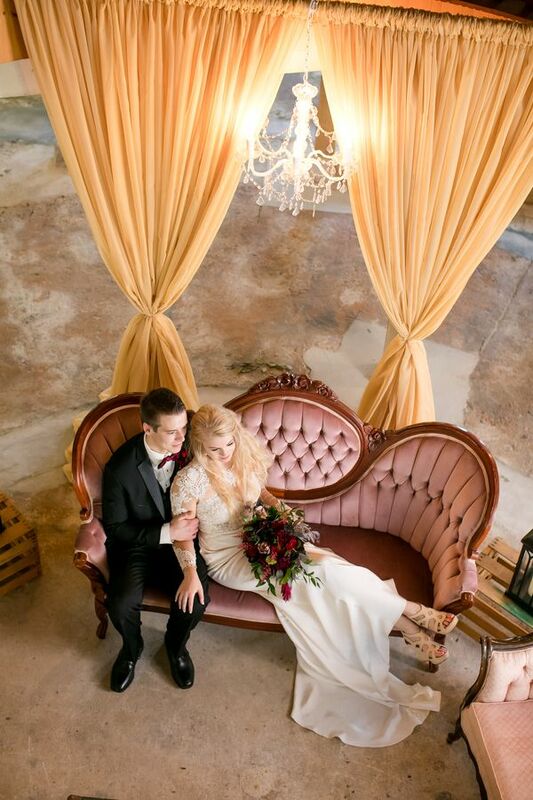 The chairs are accented with a burgundy sash and a lace sash for romantic touch." 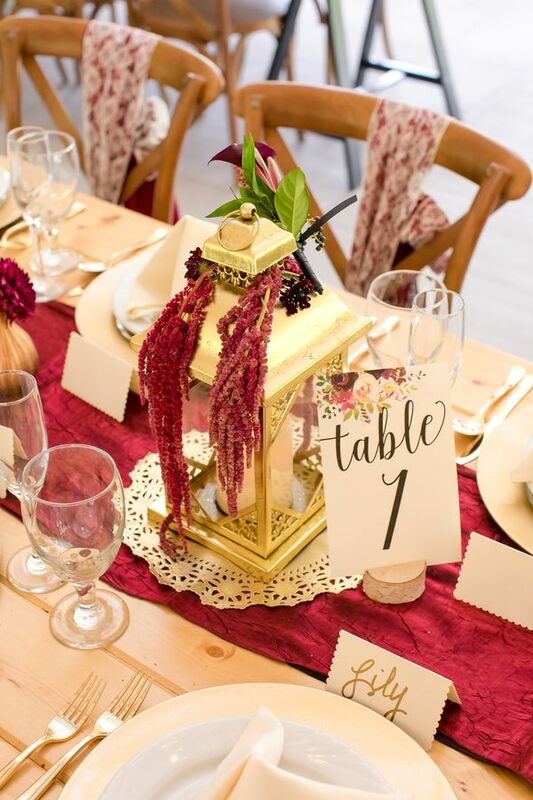 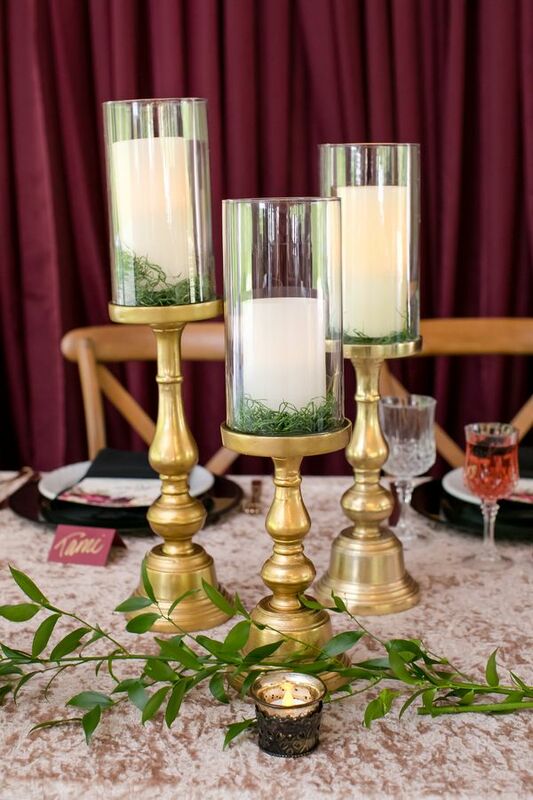 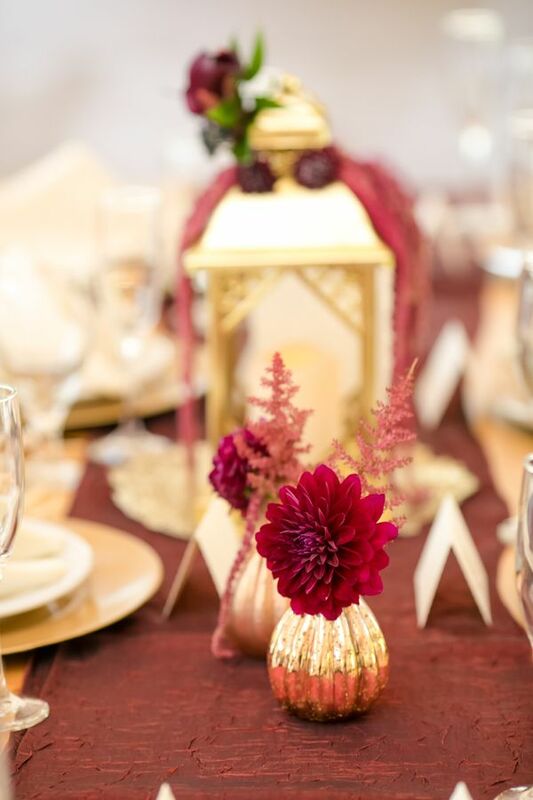 "Gold lanterns with cream candles, gold floral vases, birch table number holders, floral watermark table numbers and menu cards designed by Ink Well Minneapolis, and a burgundy runner create beautiful fall centerpieces for a long table." 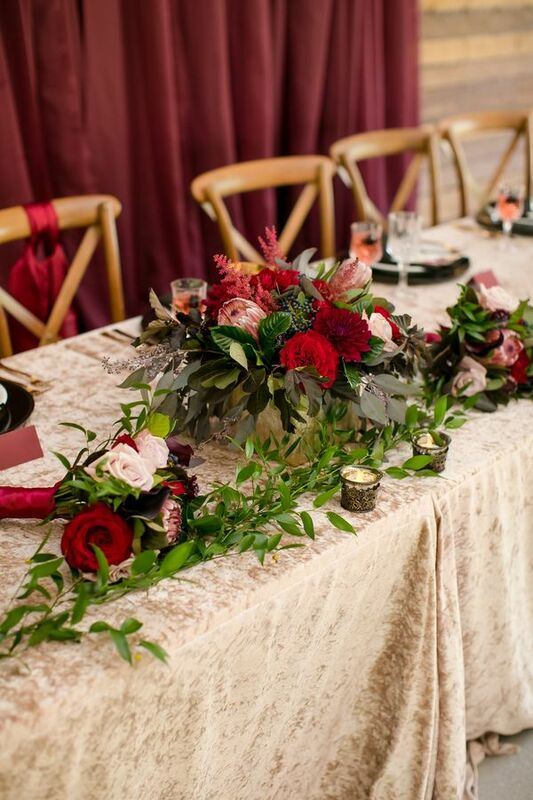 "A variety of burgundy blooms, berries, and a subtle amount of greenery compliment our color scheme throughout the tablescape." 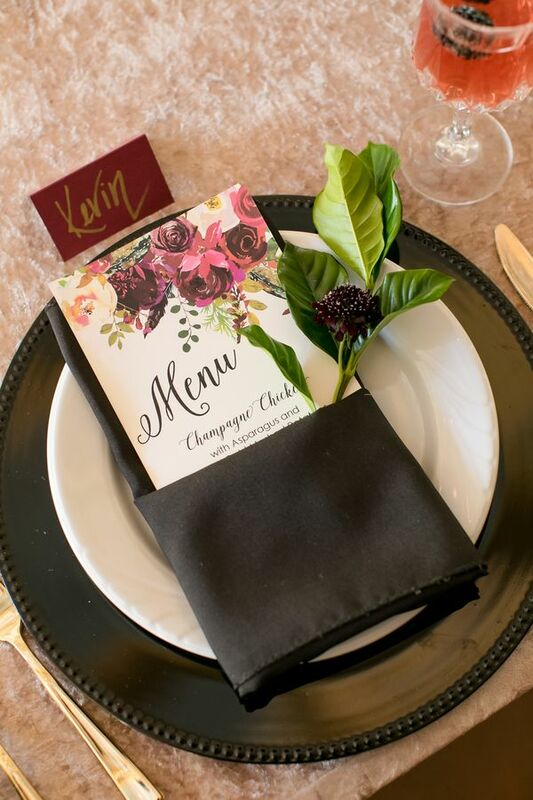 "To make our head table stand out, more greenery was used, as well as some black accent details such as the plate chargers and napkins." 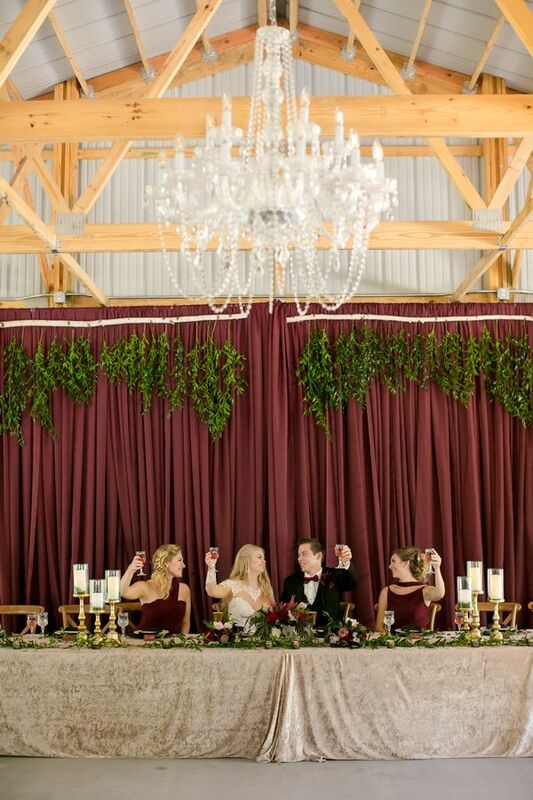 "For the head table backdrop, burgundy draping was used with greenery hanging from birch branches. 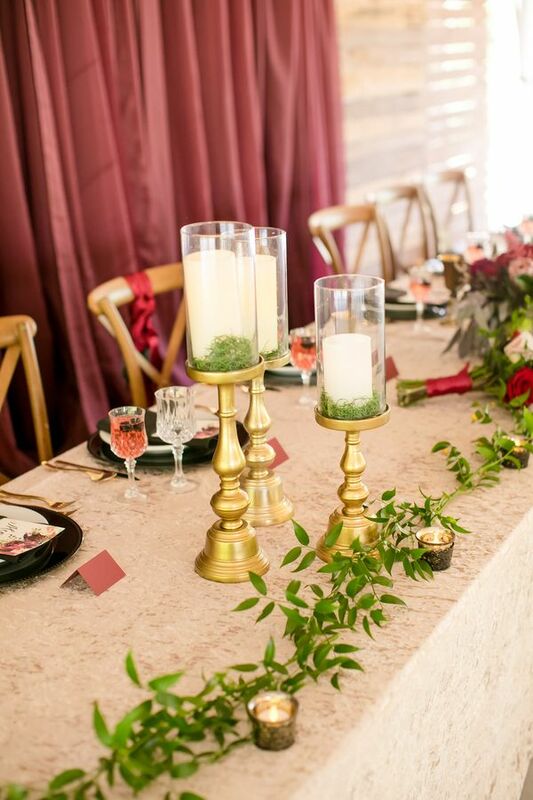 A long garland entwined with gold votive candles are used to center the burgundy bouquets and gold pillar candle holders." 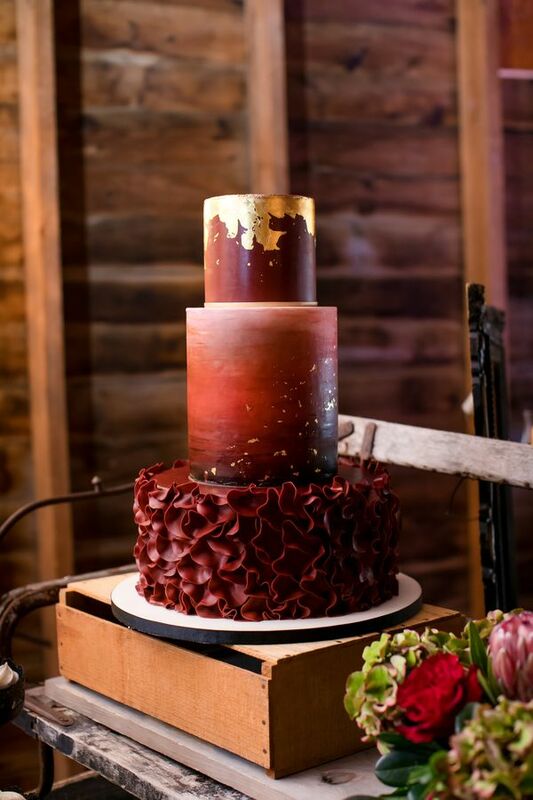 "After dinner, dive into a bite of cake with this gorgeous burgundy tiered cake designed by Miss Sara's Cakery. 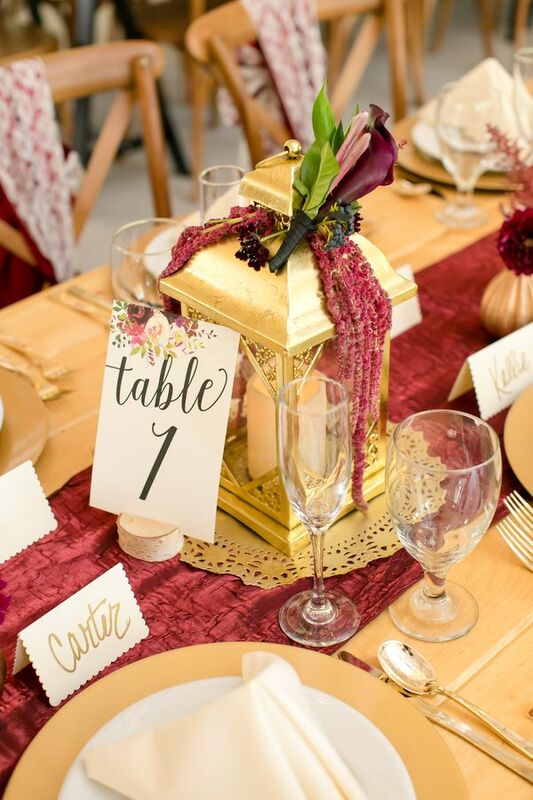 The top tier is painted gold!" 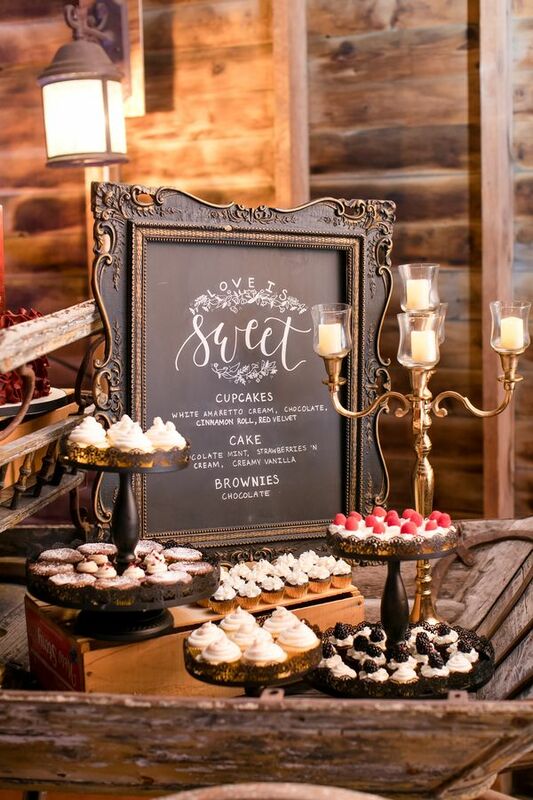 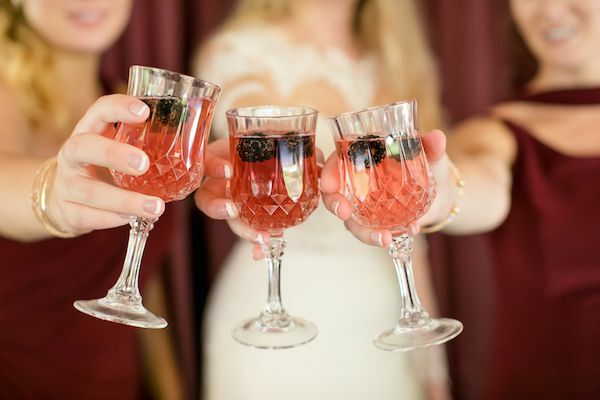 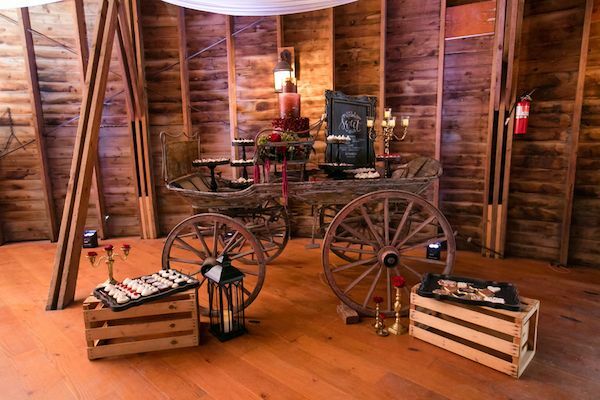 "Wedding themed cookies and small desserts placed on stands and trays fill the dessert table that’s an old horse wagon situated inside the barn." 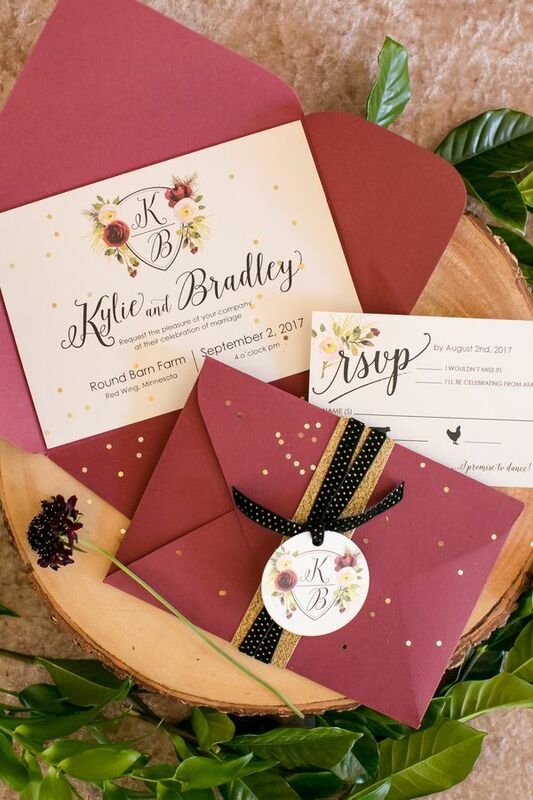 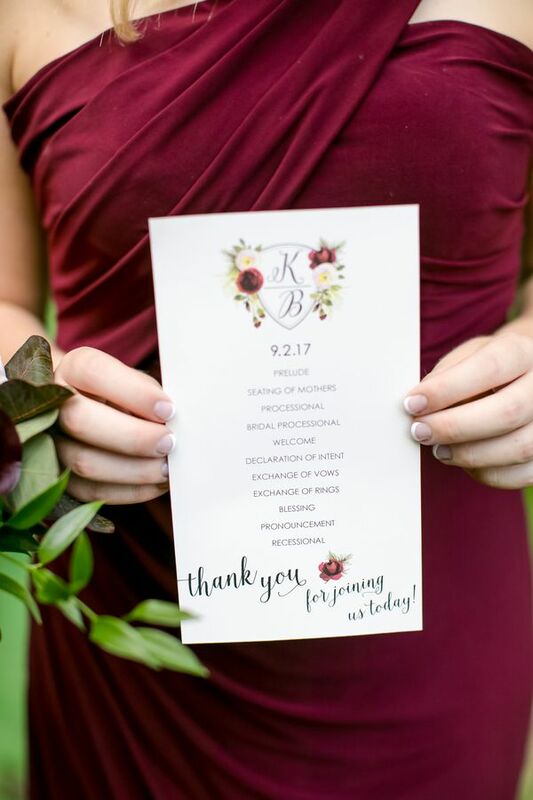 No Comment to " Burgundy and Gold Fall Barn Wedding "